First of all, just look at that fantastic painted cover. Such a great composition, capturing an Eldar Ranger in action, which is no small feat, if one knows much abut these warriors. I’ve seen some great Black Library covers over the years, especially in late 2011 and early 2012, but this one most definitely stands out as being among the very best. The story itself features, as should be apparent, Eldar Rangers. 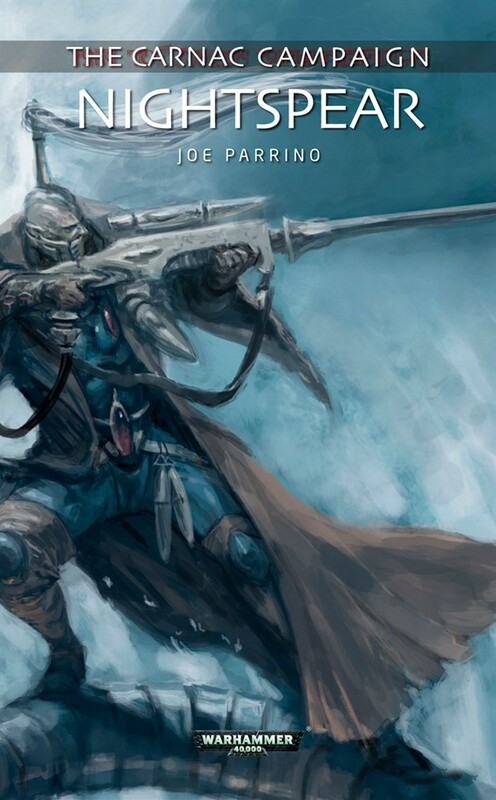 The main character of the story is an Eldar “hero” of the kind I’d expect to see in a codex, Illic Nightspear, and his characterisation by Joe is one of the main strengths of the story. Nightspear deals very much with how Illic responds to the Necron invasion of the Exodite world of Carnac, especially in the face of unexpected complications which showcase both the strength of the invaders and the Eldar Rangers alike. And that is something that I definitely appreciated a great deal. Joe doesn’t either side of the conflict an unfair advantage over the other. There is balance here. The Necrons have the upper hand in the first half, but Illic and the other Rangers retaliate in the second half and they too get the upper hand. Additionally, the cold, silent ruthlessness of the Necrons is balanced against the repressed control of the Eldar over their emotions. There is passion in their actions and in their response to the Necrons, in a way that totally fits with with the Eldar mindset. I wasn’t expecting to like Nightspear so much, and I’m glad that I did. And I think its also the first Joe Parrino BL story I’ve read and much as with David Annandale’s Eclipse of Hope last year, Joe is off to a fantastic start. I expect more goodness from him. The second story here features a new Warrior Aspect of the Eldar, the Crimson Hunters. Taking to battle aboard Nightwing fighters, these Aspect Warriors dominate a battlefield from the air and they are as much of a precision instrument in the Eldar fighting machine as any of the more popular Aspects, such as those found in Codex: Eldar. When I picked up this story, I wasn’t expecting to be treated to such a fantastic concept and this is one of the reasons why I liked this short story so much. Illic Nightspear and his Rangers formed the first stage of the Eldar response to the Necron invasion in Nightspear. In Sky Hunter, Exarch Keladry Ragefyre and his Crimson Hunters form the second stage of the response. 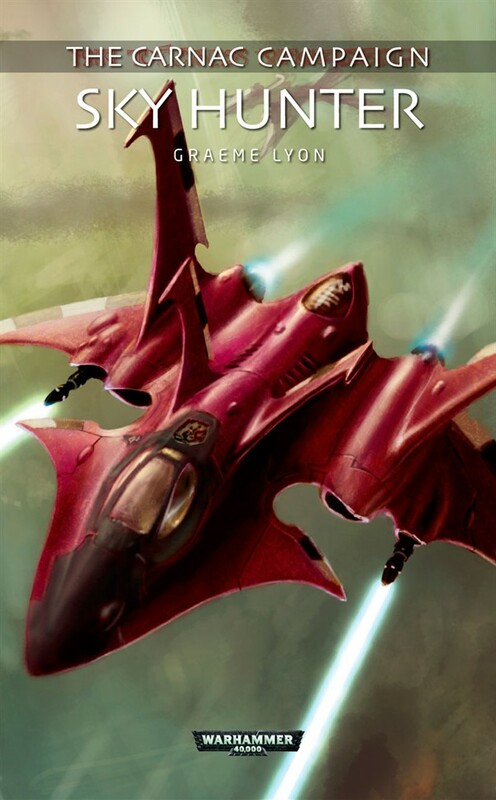 With the battle now committed and the Eldar and Necron armies now finally engaged on the field of battle, the Carnac Campaign takes on a new dimension and the Crimson Hunters are at the heart of it all. Of late, I’ve noticed that there is a concerted effort at Games Workshop to expand the roster of Eldar Warrior Aspects in the lore. We saw one prominent example of this in Imperial Armour Volume 11: The Doom of Mymeara, in which we were introduced to the Shadow Spectres. And now we have the Crimson Hunters, who fit in with the lore really well and are unique in their own right, which is an important thing to keep in mind when something like this is concerned. Where the story itself is concerned, Graeme employs repetition in the narrative through the flashbacks of Keladry as he remembers the fall of his love at some point in the past, before the Carnac Campaign. It was an event that changed his life and much of the story is taken with the consequences of that event. Keladry is a nihilist and the story is about him learning to deal with his nihilism and coming to accept the past events. Graeme really gets into Keladry’s mind and he tells a fantastic story from his perspective, while also at the same point progressing the story of the Carnac Campaign as well. Things are starting to go not so well for the Eldar, for various reasons, and the Necrons continue to make inroads throughout the world, pushing the Eldar, both the Alaitocii Craftworld Eldar and the Exodite clan-blooded Eldar of Carnac. I loved the story, and since this was my first Graeme Lyon story, as far as I can tell from memory, I’m certainly looking forward to more from him! Now finally we move to the metaphorical cap-stone of this trilogy of short stories. Written by one of my favourite BL writers, Rob Sanders, Spirit War presents the third and final stage of the Eldar campaign to save Carnac. As with the first two short stories, we see a completely different method in which the Eldar wage war on their enemies: the Wraithguard. Psychoactive constructs powered by the souls of Eldar long dead, these are often the last resort by the Craftworld Eldar armies, for they represent a certain desperation and a willingness to sacrifice the past to safeguard the future. And that is a concept that Rob Sanders grabs by the throat and runs all the way with. This time we meet Kael Ra, a former Autarch of Alaitoc who is a noted hero and has long passed. With the war on Carnac in its last stages and with every other option exhausted by Alaitoc’s leader Farseer Eldorath Starbane, Kael Ra and a coterie of other great war-heroes of the Craftworld are pressed into service to save the day. Rob deals with Kael Ra’s initial reluctance, and later full commitment to Carnac in a really cerebral way. It all feels real and personal. It feels immediate and intense. He essentially repeats his success with Legion of the Damned, a Space Marine Battles novel that I consider to be one of the best BL publications in the recent years. Spirit War is also a story where we get to see the Eldar “Wraith-mode of war” in detail. 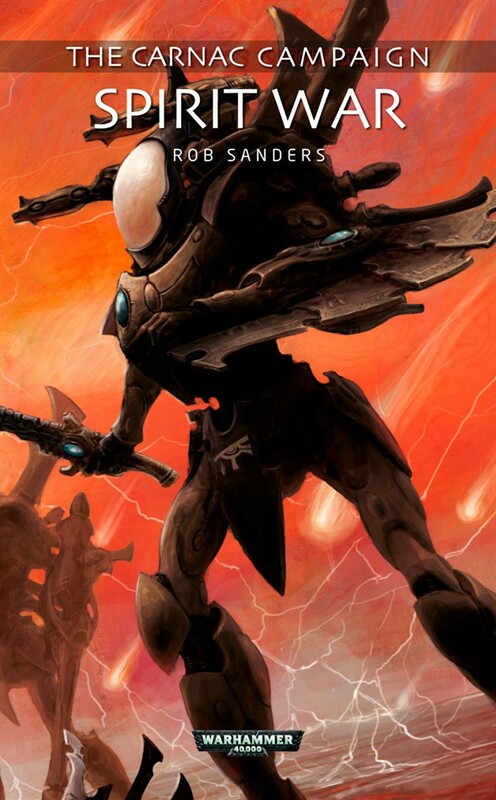 We start with Kael Ra in a Wraithlord, and we also get to see an impressive Wraithknight piloted by a pair of Eldar twins, and we see various other constructs both big and small, each with a personality of its own, defined by the hero who pilots it. Spirit War is also notable because it finally provides a detailed vision of the Necron army on Carnac. We’ve already seen glimpses of Anrakyr the Traveller and Nemesor Raznaak, but we also get to see much more. Necron armies are defined by the lords who lead them, both big and small, and so it is only fitting that these lords of have certain personalities. In actuality, this is a recent development, coming through the most recent version of Codex: Necrons. Here, we see the Dynasts of the Karnaq Client Annectate, the Royal Hetch, and the Deneveh Imperfecta, and more. It adds so much to the story. Where the Necrons of old used to be faceless and lacking in any kind of personality at all, they are so much more now, and I really like the new twist. It adds colour to the stories about them, such as with Spirit War here. Overall, I really like this approach to short stories, a series of stories written by different authors and yet telling an over-arching narrative. What BL did with Carnac Campaign here is a bold experiment that I certainly wouldn’t mind seeing repeated in the future, perhaps with other xenos races in the Warhammer 40,000 setting or even its counterpart, Warhammer Fantasy. Its a great way to showcase authors new and old alike, much as the eShort experiment, which is putting out a series of themed 1,000 word stories, and I love the immediacy of the format. I want more, more and more! Posted on September 14, 2013, in 2013 Reading Challenge, 2013 Writing Challenge, Challenges, Review Central, Short Story Reviews and tagged 2013 Reading Challenge, 2013 Writing Challenge, Carnac Campaign, Challenges, Eldar, Graeme Lyon, Joe Parrino, Necrons, Nightspear, Review, Review Central, Rob Sanders, Short story, Short Story Reviews, Sky Hunter, Space Opera, Spirit War, Warhammer 40000, Xenos. Bookmark the permalink. 6 Comments. They do great work, the writers at Black Library – an anthology of shorts stories (Treacheries of the Space Marines) was my first introduction to W40K fiction, and I haven’t looked back since! Treacheries is quite a good anthology. I loved it.